WIAW And Some Thoughts: Tweak The Recipe, Or Stay True? I learned about What I Ate Wednesday (WIAW) from a blog I follow and love, The Pink Rachel. I went over to the parent site, took hold of the concept and decided to try it out on my own. I think it is a great way to keep posting regularly, and fits in so well with our love for food. So yesterday morning, breakfast was Honey Loops. Seriously, you do not need to see a picture of that. 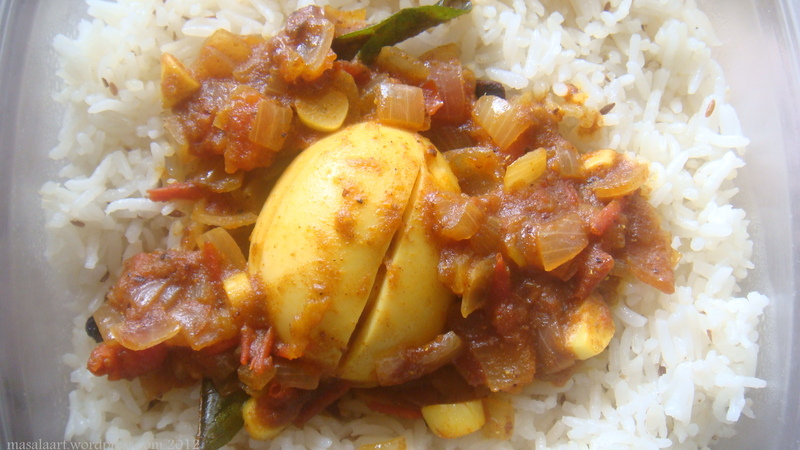 Lunch was egg masala with jeera rice. Egg masala is a spicy and tasty dish which can be made in a jiffy. I will post the recipe soon. 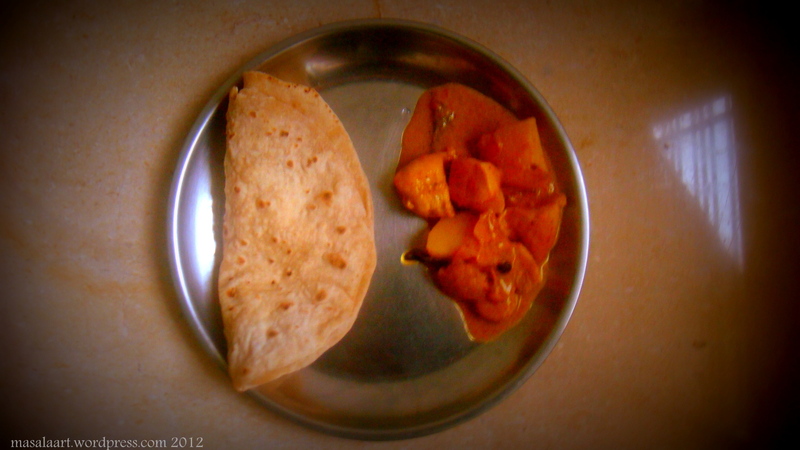 Dinner- chicken curry and phulkas, Easy-peasy. Yeah, the photo is all blurry. Meh. I had never thought of this before I came across this post. NEVER. Most of the stuff I have tried out here are adapted recipes, especially under the ‘baking’ category. In some cases, I just wanted to add something extra, like with the orange and chocolate chip pound cake. I love chocolate chips. I really do. In the case of the custard tea cake, I stuck to 90% of the original recipe- I just could not source the rhubarb, so used mangoes instead. Having said that…I have still not bothered to try the orange pound cake as just an orange pound cake. Every subsequent time I made it, I added chocolate chips and did it my way. Same for these spiced chocolate chip cookies. I think I should make a batch, sticking to just the original, and appreciate the goodies as they are. Do I change recipes because in my mind, I do not want to see myself as a copy-paster? So…your turn. Do you tweak or do you stay true to the recipe? I’ve been cooking long enough, Meenakshi that I can tweak a recipe without making it full on the first time. I know our tastes and can adapt a recipe from Like to LOVE! I don’t think it’s disrespectful at all, in fact, I expect people to do it to my recipes. That is true…the more we cook, the more comfortable and confident we become doing things our own way! I am glad that most people like to change things around, whether it is to suit their tastes or for convenience. Thanks for sharing your thoughts!! mmm looks yummy! I hope to try some of your recipes soon! They sound so healthy and yummy! Now if only I could get my husband to eat something healthy for once…. Thanks so much! Well, I think it is a truth universally acknowledged that we all try to get our husbands to eat healthy- mostly in vain! Thanks! I think so many of us cook by instinct, changing a recipe a little bit happens naturally. whaaaaaat? a butcher, baker, curry maker? what a fabulous repertoire! we are obsessed with curry in my home…will be perusing your blog for recipes! Thanks so much for stopping by! Well, more of a baker and curry maker, but the butchering does happen every so often. Hope you like it!! I’m a bit like Barbara, I usually have a nosy round at a few similar recipes then head off to muddle them all together into my own thing. I think for me, it’s mostly my inability (reluctance) to measure ingredients that comes into play with this one. I’m a chuck it all in and hope for the best, so if I was baking (when I ever have an oven again…) I would probably follow the recipe exactly as I’m not as good at it and the measurements are more important, but for savoury, I’d be more likely to chop and change a bit. Also, thanks for the mention – that was a nice surprise when I popped over to see what you were up to this morning! I understand what you mean- I also fall into the trap of getting too lazy to measure correctly! So often if a recipe calls for just 100 grams of choppe d chocolate, I add in some more 🙂 Oh and savoury, exp Indian cooking is all about touch-feel-taste-adjust! You’ve raised some interesting points, Meenakshi! I think it’s completely okay to adapt recipes as you go along…that’s the beauty of cooking in my opinion! I often do for the same reasons as you do: to suit my palate and to incorporate ingredients which I do have on hand! However if I’m blogging about it, I will always give credit to the original recipe and say that I have adapted it or been inspired by it! I am glad that there are more bloggers out there who share my thoughts and experiences. And you’re right- the beauty of cooking and baking lies in being able to create new flavours that you enjoy even more! Oh an amalgamation of a few recipes! I have that too. I do snack as a matter of fact…a little too much at times! I am one of those people who feels this terrible need to sip or munch on something when I am in front of the TV. I try to spend less time in front of it now!! Oh, and the egg masala looks divine! I almost always tweak, for many of the same reasons you mentioned. I usually add more garlic, more spice or more of what I love! Great point Heather. You need to give credit where credit is due!! Whether it is allrecipes or Tony Bourdain himself. I adapt a lot, but I should take a classic recipe for my next post and execute it word for word.